Much of the estimated 50 million tons of discarded electronic waste from around the world ends up at poorly regulated dumping sites in low-income nations. The world’s biggest e-waste dump is Agbogbloshie in Accra, Ghana. Workers at such sites attempt to salvage materials from old TVs, computers, cellphones, batteries and other unwanted electronic goods. They use basic tools and open-air burning that exposes them to a variety of chemicals, heavy metals and other health risks. 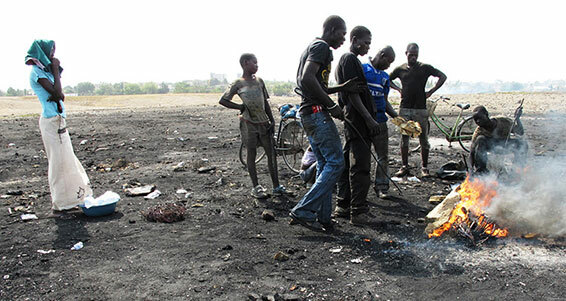 To get a better understanding of the potential relationship between exposures to heavy metals from e-waste with noise and hearing loss, Rick Neitzel, of the U-M Risk Science Center, is leading a team of researchers to Agbogbloshie. Over a two-week period in April, 60 workers from the e-waste site will be recruited to participate in the study. For each of the participants, the U-M team, working with colleagues at the University of Ghana School of Public Health, will conduct hearing tests, measure noise levels, and collect urine and blood samples for analysis. In addition each participant will be interviewed to assess their demographic characteristics, health status and use of personal protective equipment. “An in-depth understanding of the relationship between exposure to lead and cadmium, hearing loss and nutrition will be globally relevant. We hope that the outcomes of this study will lead to improved exposure reduction interventions,” Neitzel added. The U-M research team includes Krystin Carlson, a candidate in the U-M Toxicology PhD program and co-principal investigator on the project; research specialists Rachel Long and Stephanie Slayer; and Mozhgon Rajaee, a candidate in the U-M Environmental Health Sciences PhD program. The project, “Nutrition, Heavy Metals, and Hearing Loss Among E-waste Workers in Accra, Ghana,” is funded by Pilot Project Research Training Program through the U-M Center for Occupational Health and Safety Engineering, which is sponsored by NIOSH. Ishani Hewage is a communications specialist at the Risk Science Center. Photo credit: The image used in this post is licensed under a Creative Commons Attribution-NoDerivs 2.0 Generic. It is attributed to the Basel Action Network.